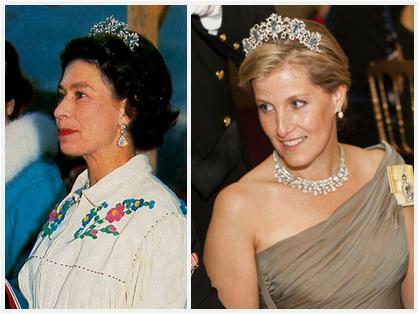 This tiara, composed of five aquamarines set in a ribbon-like diamond surround, was worn once by the Queen during a 1970 trip to Canada before it disappeared back into the vault. Some suspected it had been broken up, but it was proven to be intact when it reappeared on the Countess of Wessex. Chances are it is a loan to the Countess, so we will include it here as technically a part of the Queen's collection.